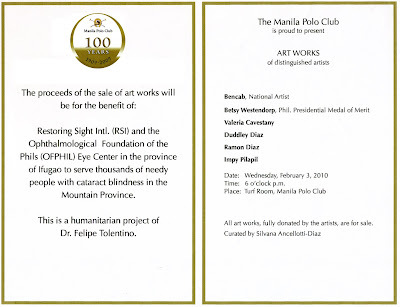 The Manila Polo Club hosted an art sale on February 3, 2010 to benefit thousands of needy Ifugaos and residents of nearby provinces suffering from cataract blindness and other eye diseases. Multi-awarded artists who participated in this fundraising event have fully donated their masterpieces. Among them were National Artist Bencab, Betsy Brias Westendorp, Valeria Cavestany, Duddley Diaz, Ramon Diaz and Impy Pilapil. The paintings and sculptures were curated by Silvana Ancellotti-Diaz. Proceeds of the sale of artworks would help fund the projects of Restoring Sight International (RSI) for its work with the Ophthalmological Foundation of the Philippines (OFPHIL). Together with the Ifugao State University (IFSU), this eye center located in Alfonso Lista was inaugurated on January 26, 2010. The eye center is now called IFSU-OFPHIL Eye Center. “The impact of this project is great for the people of Ifugao and the Cagayan Valley region because it is located in an area with the highest incidence of blindness in the entire Philippines. Thousands of patients with cataract are expected to benefit from this center after several years,” said Dr. Felipe Tolentino, founder of RSI. More than 40,000 underprivileged residents in Ifugao and nearby Cagayan provinces experience cataract blindness. The establishment of this new eye center is a momentous event as it represents the largest commitment of resources that RSI and OFPHIL have ever dedicated to a single project. It is the first RSI/OFPHIL eye care center outside of Metro Manila. It will, without doubt, serve as a model for future chapters of RSI. “This advocacy is very meaningful to me as I myself suffer from age-related macula degeneration (ARMD). It affects older adults resulting to the loss of vision in the center of the visual field. I am more than happy to be part of this fundraising project especially when Ambassador Isabel Caro Wilson broached the idea of hosting a cocktail to support Dr. Tolentino’s eye center program,” said Betsy Brias Westendorp, Philippine Presidential Medal of Merit Awardee. The art sale was held at the Turf Room of the Manila Polo Club which celebrated its centennial last year. Holding the distinction of being its first lady president, Ambassador Wilson led the Manila Polo Club’s Centennial Renewal project, which covered the construction of a state-of-the-art kitchen, an elegant new lobby leading to the Turf Room and McKinley Room and the Banyan Garden overlooking the lobby. “Both Betsy and I are patients of Dr. Tolentino. The IFSU-OFPHIL Eye Center in Alfonso Lista is a prime example of corporate social responsibility, and of giving back the blessings we receive to those who have less,” said Ambassador Wilson.